When the pavement ends, your ride doesn’t have to. A lightweight ALUXX SLR aluminum frame, smooth-handling composite fork, and drop-bar positioning make ToughRoad SLR GX the right choice for adventuring into the unknown. The fast-rolling 700c wheels are fitted with Giant tubeless tires. These allow you to run lower tire pressure for comfort and traction, and they also reduce the risk of flat tires. The D-Fuse seatpost absorbs road vibration and shocks to help minimize fatigue on long rides. And powerful disc brakes with 160mm rotors give you added confidence and control on rough roads and in all types of weather. Thoughtful details including integrated rack mounts and the X-Defender downtube complete the package, making ToughRoad SLR GX the perfect machine for tackling imperfect roads. State-of-the-art aluminum frameset technology features Giant's highest strength-to-weight ratios, most advanced forming methods, and unique welding techniques. 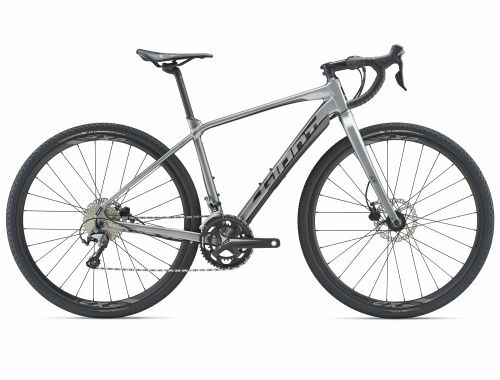 The frame is engineered with flat-mount disc brake integration for superior braking performance in all weather and road conditions. The frame features unique internal cable porting for sleek, uncluttered appearance and performance. Protects frame and rider from dirt and rocks while providing smooth cable routing for adventurous riding. Integrated mounts make it easy to customize with bags and accessories for touring, trekking or gravel riding.